This week we partner with British magazine Riddle to bring you new and exciting stories from the world of luxury. Managing editor Rupert Watkins has opened up the magazine’s archives to Living it, and we will be publishing a series of their best content everyday this week. Riddle Magazine was born to prove that “true craft, quality, style and luxury should be staples of life”. Working in Investment Banking in Milan, Luca Maselli had inherited his father and grandfather’s collection of work ties, many of them Hermès from the 1970s and 1980s. Having always had an interest in fashion, he was increasingly struck by why the modern tie just didn’t quite stand up against its stylish forebears. So in 2013 Luca founded Masel ties seeing a niche market for beautifully produced, classic and personalised neckwear. The first year was spent hunting for the correct craftsmen and silk factories before he felt able to go full time, which he did in June 2014. All roads lead to Como and the centuries old silk weaving and craft industry that clusters in this corner of Italy. Early on, Luca focused on a bespoke option for his ties – something he has found has been very popular and much appreciated by customers. The length and width can be customised, a dedication or initials can be stitched into the lining of the tie and of course the tie itself and linings can be chosen from a range of silks. The linings are a wool and linen mix from a factory close to Bologna. Luca sourced the best company in Italy for this. For those who struggle to find a wider three and a half inch tie with the current trend towards narrower ties, Masel is a wonderful option to explore. The range of silks is excellent – restrained, tasteful and elegant. From his earliest memories, Luca remembers being taken into the tailors and shoemakers in his home city of Bologna. His father had a keen interest in style and elegance, which Luca inherited. 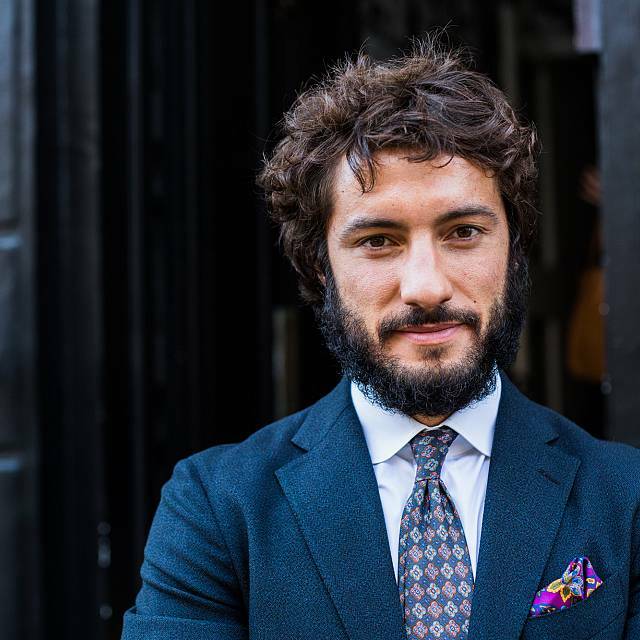 Luca had been keen to run his own business for some time whilst working in Milan and wearing his family’s Hermès ties provided the sartorial spark to make that entrepreneurial leap. Once Luca had made it his full time career, as well as finding and building relationships with his Como artisans, most of Masel’s second year has been spent developing a network of distributors. 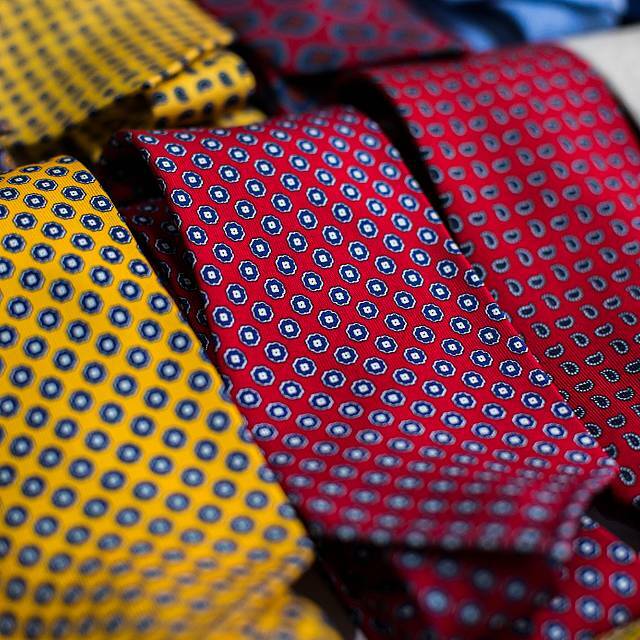 In the UK his ties are stocked by 40 Savile Row and he has shown with The Independents Club at trunk shows. He has found other distribution partners in New York, the Netherlands, Belgium Hong Kong and Switzerland. Along with his bespoke offerings, Luca has also introduced a ready to wear range of ties. These are in a slightly lighter weight silk and come in a standard three-inch width with unlined tips. He has found many of his customers prefer a slightly lighter tie with a longer tail to it. For Masel’s bespoke ties a heavier silk is used – certainly this writer prefers a heavier weight tie as it hangs better and the knot sits more nicely. 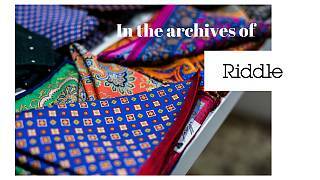 Luca uses a second factory in Italy to produce his ready to wear ties, in conjunction with his main workshop that focuses on the bespoke orders. For his Autumn Winter 2015 collection, Luca has enlarged his ready to wear collection to include cashmere, grenadine and grenadine shantung ties and introduces a selection of exceedingly dashing pocket squares and cashmere/ wool scarves. There is also a small collection of ready tied and tie-your-own bow ties. Luca has found half his customers are women buying his ties as gifts for men. Consequently they are very appreciative of the inscription service and they focus in on that. In an era where the ability to put a personal stamp on your garments is all important, Masel ties are a stylish way to find that final debonair touch. Those who find that even Jermyn Street is covered in rather stiff, shiny and uninteresting ties should head to Masel’s website. For the remarkably good price of £78 – inscription and initialling a little extra – these are a damn fine buy. Author: Rupert Watkins, managing editor of Riddle Magazine. Follow Riddle on Facebook, Twitter, and Instagram.